Threadless needs little introduction but in short, the company was founded by Jake Nickell and Jacob DeHart in 2000 with just $1000 made from winning a t-shirt contest. Threadless is a t-shirt design community where users submit designs, community votes, and staff choose between the most popular designs. Artists who have their design picked for printing win a cash prize. Gear Crave did a brief interview with co-founder and CEO Jake Nickell. Jake told Gear Crave that Threadless plans on expanding their kids product line and are working on their international distribution. This year Threadless plans to open two more retail stores including a Threadless store for kids in Chicago and a standard Threadless store in Boulder, Colorado. 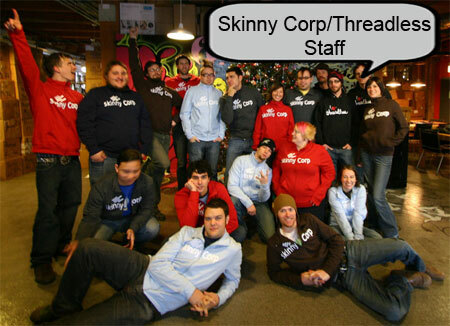 i want to know the full story of threadless.